I've been wanting a pair of western boots for some time. So this past weekend when Little Gen and I were in the artsy town where we grew up, it seemed like the perfect opportunity to look around. 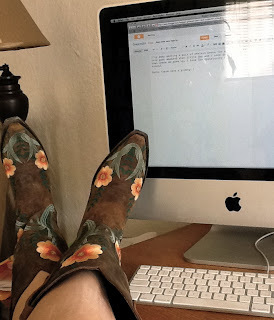 Boots there were a plenty, but after you've looked over the first two hundred pair, it's hard to tell what's working--do you want shiny or scuffed, dark brown or blue, snakeskin or rhinestone--I'm a one-arm rhinestone cowgirl? No, definitely not rhinestone; I might be an urban cowgirl, but I draw the line at rhinestones. And then there's the fit--the heel can't be too tight, the instep too lose. You have to walk around in them. Then you have to imagine walking into the future with them; ask yourself, can I go the distance with this boot? I tried on some pre-owned boots; boots that were in a previous relationship with other feet, but for whatever reason, they were put back on the sales rack. I tried on a pair of white Tony Lama's that fit like an Isotoner glove. They put exactly the right amount of pressure on every part of my foot--like a perfect hug. Apparently I have a foot twin out there somewhere. I just couldn't commit to the white with black heels--a little too flashy for me. Suffice to say, there are a lot of pretty boots out there. But when you've got endless options and only three hours of shopping to make a decision, every boot starts to look nice, but not nice enough. We decided to take a break at Haagen-Dazs. When in doubt, get ice cream; or a cream-filled chocolate doughnut. Whatever. I'd given up the search, resigned myself to remaining bootless, when we found them--Aged brown leather with bright yellow embroidered flowers. I walked right by them, but Little Gen liked them right away. She tried them on first, but it just wasn't the right fit. I tried them on, but still wasn't convinced. So, I walked around, took them on and off, then caught my reflection in the mirror. They were bolder than I was looking for, but I realized they were me--colorful, bold, but simple in their own way. I bought them. In years of shopping, I've learned you can't force things. You may not find what you're looking for, or you may forget what you came for in the first place. I've definitely purchased items that fit all my criteria, only to find as soon as I get home, I've already lost interest. More often than not, the really good buys are a surprise-- things that when you see them, you say 'No way,' but you find yourself smiling. And after the initial shock, you realize you can't go on without it--a pair of boots, that is.